A look at folk tales and their origins in the natural world: “Lovely, inventive . . . thought-provoking” (Publishers Weekly). Fairy tales are one of our earliest cultural forms, and forests one of our most ancient landscapes. Both evoke similar sensations: At times they are beautiful and magical, at others spooky and sometimes horrifying. Maitland argues that the terrain of fairy tales is intimately connected to the mysterious secrets and silences, gifts and perils. 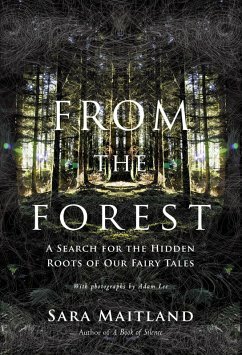 With each chapter focusing on a different story and a different forest visit, Maitland offers a complex history of woodlands and how they shape the themes of the fairy tales we know best. She offers a unique analysis of famous stories including Rapunzel, Hansel and Gretel, Snow White, Little Red Riding Hood, Rumpelstiltskin, and Sleeping Beauty. Maitland uses fairy tales to explore how nature itself informs our imagination, and she guides the reader on a series of walks through northern Europe’s best forests to explore both ecological history and the roots of fairy tales. In addition to twelve modern retellings of these traditional fairy tales, she includes beautiful landscape photographs taken by her son as he joined her on these long walks. Beautifully written and impeccably researched, this unique book puts a news spin on our oldest stories.